With the increasing focus on BYOD at work places, Google has acquired Divide, which had made quite a few strides in the mobile enterprise security. 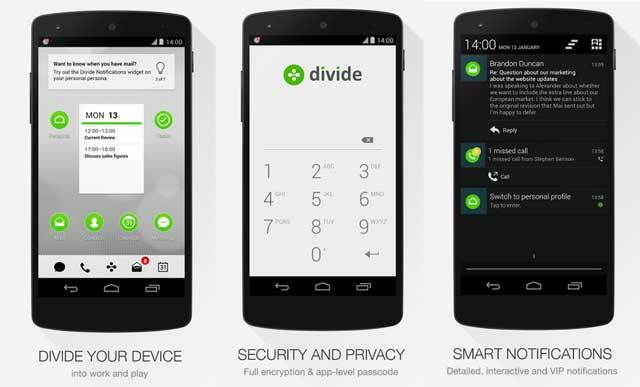 Google has apparently acquired Divide for an undisclosed amount. The app creates a container each for the personal profile and the business profile, thus allowing the device to be used on corporate networks without the interference of the personal profile. The users can use the app to connect to the Mobile Device Management used by major companies and then swipe between work and personal profiles. The services of Divide app are currently priced at $60 per user/per year but there is also a limited free tier. However, post-acquisition it remains to be seen how Google plans on using the service. In fact the service could be implemented within Android itself, making Samsung’s starred KNOX service redundant.